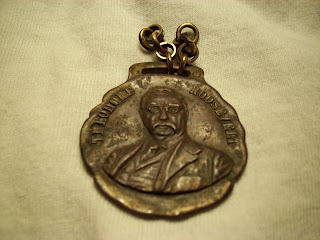 I have a medallion/token from a banquet in honor of Colonel Roosevelt. One side reads: Banquest in honor of Colonel Roosevelt. Hamilton Club of Chicago 9/8/1910. The other side features the upper body of Theodore Roosevelt. There's a little chain with links atttached. I haven't been able to find anyone to tell me more about it. If you can help Kyle please click on the comment button or email us at appraisals@loriferber.com and we will forward your information or offer. 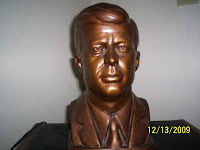 Submitted by Kent: I have a 12 1/2" high x 7" wide plaster bust of JFK. It has brown or bronze paint. It is in excellent condition. I can't find one like it anywhere after many hours of research. It belonged to my great grandparents. How do I find the value and history? Thank you. 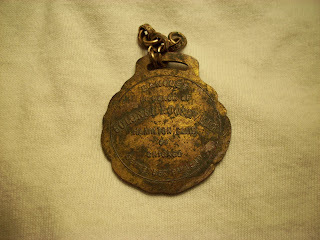 If you can help Kent please either add your comment or email us at appraisals@loriferber.com.